The MS Spalato is a modern vessel offering a first-class small cruise experience for up to 36 guests. The 36.7 m cruiser boasts the latest safety features and attentive service. Guests can relax and unwind in comfortable and well-equipped air-conditioned cabins that are arranged over three decks. There is an air-conditioned restaurant, plus two sun decks on two levels with plenty of deck chairs for everyone. To the rear of the ship, the swimming platform with ladders provides direct access to the inviting turquoise sea. The spacious air-conditioned lounge with TV is a great place to socialise with a drink served from the bar. The MS Spalato is a modern 36.7 m vessel offering the latest safety features and a comfortable and spacious intimate cruise environment. 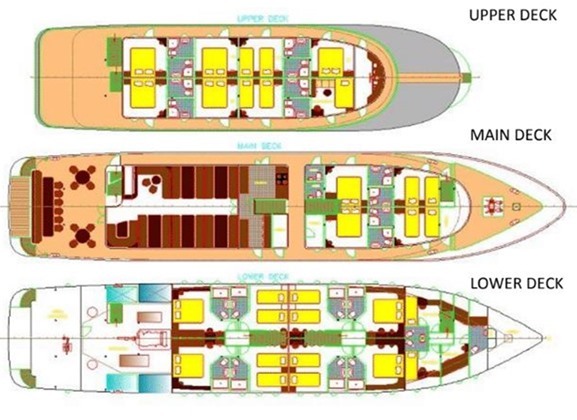 The ship boasts 19 air-conditioned standard twin/double cabins that are arranged across the upper, main and lower decks. Public spaces include a large air-conditioned restaurant that flaunts panoramic window views, a bar and a comfy TV lounge. 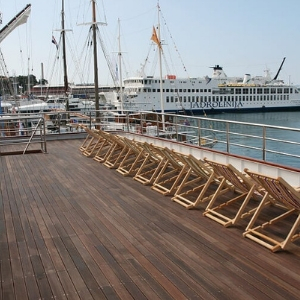 The exterior of the ship features a choice of two sun decks, on two levels, that are furnished with an array of deck chairs. The swimming platform at the rear allows for easy access to the sea during scheduled swim stops. The standard twin/double cabins on the MS Spalato are designed to provide a spacious and comfortable private zone for ultimate relaxation. 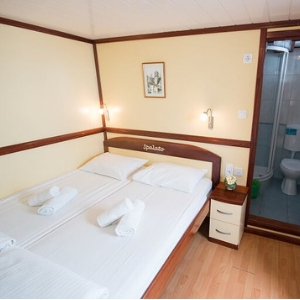 The 19 air-conditioned cabins are decorated and furnished in a functional modern style and include an en suite bathroom with shower, a wardrobe, desk, in-room safe and hairdryer. Complementary toiletries are also provided. The airy cabins are arranged on the upper, main and lower decks and offer window or porthole views. Flexible bedding configurations accommodate a maximum of 36 guests. The ship’s communal areas are well-equipped and spacious, and perfect for relaxing and socialising. 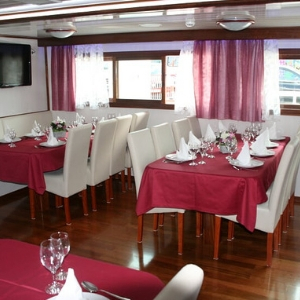 The heart of the MS Spalato is the air-conditioned restaurant that comfortably accommodates all guests in a single sitting. The panoramic windows ensure that there is always stunning scenery on view at mealtimes. There is also a well-stocked bar and a cosy TV lounge offering a daily entertainment option. 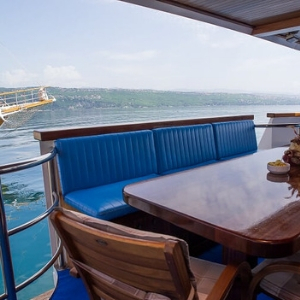 Guests wishing to soak up the sun have a choice of two spacious sun decks on two levels. Deck chairs are provided. During scheduled swim stops, the swimming platform at the stern offers easy ladder access to the sea.